“Nothing is impossible.” Christopher Reeve. He’s been gone for 55 years but for generation after generation he has thrilled & entertained us. He was the first actor to portray the man of steel in full color. And he is the granddaddy of all TV super heroes. But behind the scenes George Reeves lead a shocking (even by today’s standards) life. Witness a tribute comic like no other when Bluewater journeys from the heartlands- to the “city of tomorrow”, as everyday people review George’s career ,and his place within the history of American pop culture. Join us as we celebrate the man who personified America’s first and greatest superhero! “I am from the generation that was lucky enough to first witness Christopher Reeve on the big screen in the winter of 1978. To say that movie and the character has had a life long impact on me is an understatement. 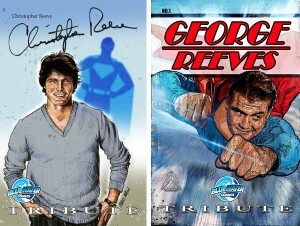 And through the years I had always admired Christopher Reeve’s courage & how he truly was an inspiration. Prior to the 1978 movie, I had a 5-year head start with George Reeves as my first live version Superman. To this day I still consider him the granddaddy of all TV super heroes. He simply defined the golden age version of that character. To be able to work on these tributes was more than labor of love. It was a true honor to bring them to life in pages of a comic,” said artist/writer M. Anthony Gerardo. This entry was posted in Columns and tagged amazon, bluewater productions, Christopher Reeve, comic flea market, COMIXOLOGY, DriveThru Comics, George Reeves, google play, iTunes, iVerse, Kobo, M. Anthony Gerardo, Michael Frizell, nook, Wowio. Bookmark the permalink. Follow any comments here with the RSS feed for this post. Post a comment or leave a trackback: Trackback URL.